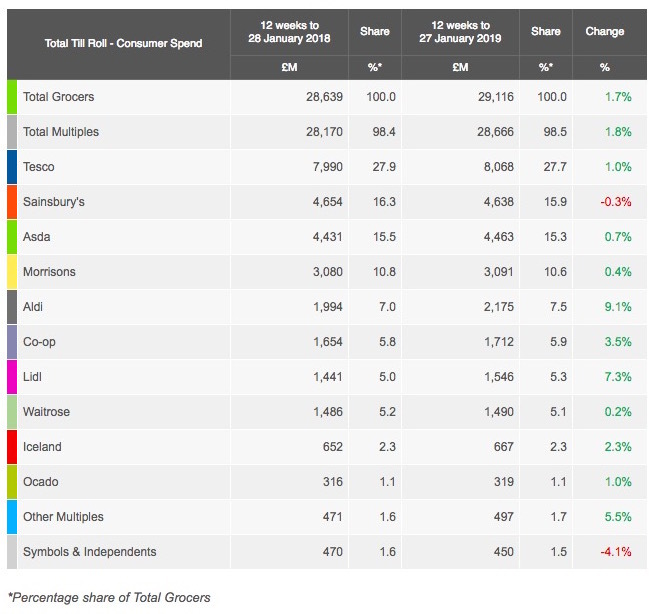 Sainsbury’s was the only major UK retailer to post a decline in sales in the 12 week period to 28 January, according to the latest Kantar Worldpanel market share figures, with the grocer seeing a 0.3% decline over the period to sit on 15.9% market share. Tesco retains number one position in the UK market, with a 1.0% sales gain over the period putting it on 27.7% market share. After second-placed Sainsbury’s, Asda holds 15.3% market share (+0.7% sales increase), followed by Morrisons, on 10.6% (+0.4%). Kantar Worldpanel said that Tesco’s centenary pledge to celebrate ‘100 years of great value’ has helped boost sales at the grocery, with its Exclusively at Tesco fresh food lines performing ‘particularly strongly’. Asda, it added was boosted by a strong online sales performance, which grew by double digits over the period. The strongest performers in the UK grocery market for the period were Aldi, which saw sales up 9.1% to sit on 7.5% share, and Lidl, which saw sales up 7.3% to sit on 5.3% share. Excluding the discounters, the Co-op also put in a positive performance, with a 3.5% increase in sales to sit on 5.9% market share. Overall, sales across the UK grocery market were up 1.7% for the period, with grocery inflation rising by 1.3%.